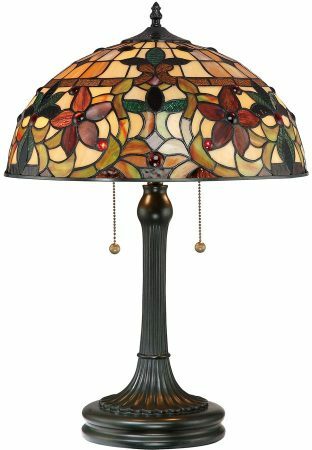 The Quoizel Kami traditional floral Tiffany 2 light Tiffany table lamp, part of a a stunning range featuring a floral design set in an Art Nouveau pattern, handmade using high quality art glass. A medium sized two light traditional Tiffany table lamp, with a detailed ribbed stem circular cast resin base finished in vintage bronze. The wonderful hand-crafted Tiffany shade contains 366 separate pieces of high quality art glass and features scenes depicting flowers, leaves and berries in shades of caramel, amber, emerald green and ginger. The floral scenes are set within a classic flowing Art Nouveau pattern. The range and warmth of colours ceate a harmonious balance of light, whilst the amber rippled glass highlights and jeweled berries will create contrast and spakle like jewels when illuminated. Fitted with two pull chain on/off switches that hang beneath the shade for convenience, flexibility and style. A hand-crafted Tiffany table lamp, soldered using traditional techniques that have been used for centuries. The shade colours may differ slightly from the image shown as each piece of glass is hand-made and may differ slightly in colour or shade. This should not be seen as a fault, rather something that makes each Tiffany shade unique. Supplied by Elstead lighting and designed by Quoizel, founded in 1930 in New York. Quoizel products are now being introduced to the UK market and have quickly built a reputation for their diverse, unique and fresh designs such as the Kami raditional floral Tiffany 2 light Tiffany table lamp you see here.